Featuring five of the most exciting young musicians in the Oslo jazz scene today, this powerhouse record is at times seemingly bursting at the seams with exuberant energy and youthful abandon, and yet the music is always underpinned by a certain melodic sensitivity and lyricism. Mind you, it might not be the picturesque, idyllic lyricism often associated with Norwegian jazz, but Bangkok Lingo’s debut record is nonetheless filled to the brim with both high-octane grooves and intense solos, as well as catchy melodies. This cheeky Håland-penned number serves as the album’s opening track, and it’s an earworm quite unlike any other; the juxtaposition of a infectiously laidback groove with a delightfully dissonant, staccato melody on top makes for a composition with stark, yet satisfyingly complimentary contrasts between layers. The title of the track is an untranslatable West-Norwegian expression, but undeniably the music speaks for itself. The second track “Salaam Aleikum” invokes an unmistakable middle eastern-esque ambience, echoed in the composition’s title («peace be upon you» in Arabic). It offers a more subdued side of the quintet’s multifaceted musical pallet, although the silent fire smoldering in the background is never quite lost out of sight. The composition offers plenty of space for both soloists to manipulate and explore different timbres and articulations, which they do to great effect. The album’s shortest tune also happens to be among its most ferociously intense – no small feat on an album like this! 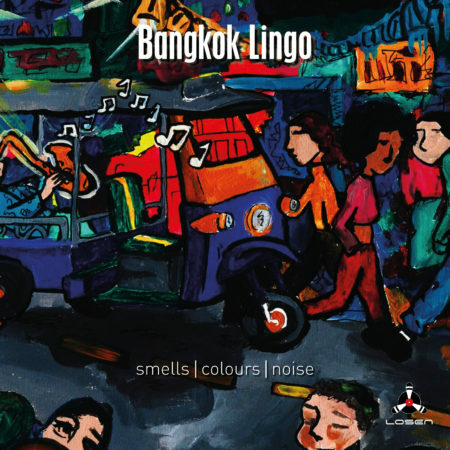 In the course of its just under 4 minute duration, «Free for all» showcases many of Bangkok Lingo’s finest qualities: memorable melodies, an abundance of energy and bucketloads of instrumental brilliance. Røed’s trumpet acrobatics as well as his willingness to reach for new sounds and take risks rather than play it safe are particularly appreciable on this track. This lively tune no doubt has qualities in common with the famous Bangkok street – a hub for international travelers and a backpacker mecca in its own right – after which it is named. There are unexpected twists and turns at every corner, and surprises abound throughout the duration of the track, which features some irrepressibly danceable grooves set up by the rhythm section. This upbeat composition written by Røed also happens to be the album’s only track in a major key, and its gleeful character provides a very effective contrast to the rest of the album. Skeidsvoll’s solo shows that in addition to being capable of some seriously powerful saxophone pyrotechnics – the rest of the album proves this beyond a shadow of a doubt – he is also a sublime melodist with a real knack for coming up with memorable lines on the spot. Imerslund’s bouncy and authoritative bass playing also comes to fore on this track, propelling the music from the bottom up with intensity and sensitivity. Among the things that make Bangkok Lingo’s chordless lineup with a two horn front line sound different from other bands with a similar setup of instruments is the addition of the wonderfully subtle-yet-effectual percussion playing of sound sculptor Ivar Myrset Asheim. «Bangkok» showcases some particularly exquisite cascades of percussive sounds, which add an additional layer of interest to an already intriguing track. It starts out mellow, building to a climax at the very end, with plenty of captivating group interplay along the way, as well as some very tasteful and delicate brush playing by Håland. The interaction between Skeidsvoll and Røed shows both initiative and keen listening: they alternate between playing contrasting and complementary textures, transitioning seamlessly between the two to great musical effect. In addition to being the title of the seminal book by writer Ronald Sanders, “Lost Tribes and Promised Lands» is the title of the last track on this album. Rounding off an album chock full of energy and intensity, this tune beautifully sums up what this band is all about: there are catchy hooks and melodies, searing solos and groovy rhythms. One can only look forward to future releases to follow up the promising debut album of this young Norwegian jazz Quintet.